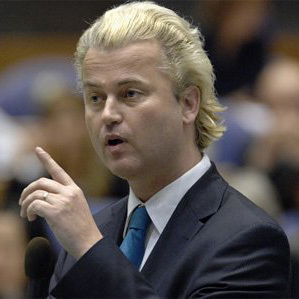 For more than two decades, Geert Wilders, the controversial anti-Islam member of the Dutch Parliament, has dyed his hair a platinum blond. He has built a career — and a new political party — on a risky and defiant outlandishness that encompasses everything from his hairstyle to his anti-Islamic rhetoric. Wilders, 44, is in the news for a 10-to-15-minute film he says he has made depicting the Koran as the inspiration for terrorist attacks and other violence. Having failed to persuade a single Dutch television network to broadcast the film in its entirety, he said he planned to release it on the Internet by the end of this month. He routinely equates the Koran with Hitler's Mein Kampf, saying it should be banned in the Netherlands, and he declared in an interview that the Prophet Muhammad could be compared to the German dictator. Wilders said he made the film to show that "Islam and the Koran are part of a fascist ideology that wants to kill everything we stand for in a modern Western democracy." Some here see Wilders' film — titled "Fitna," Arabic for civil strife — as a potential hate crime and have already filed police complaints in various Dutch cities, concerned that his past statements and the film will polarize religious groups and foster discrimination. His supporters say he protects traditional Dutch values. His critics say he is a right-wing extremist risking his country's good name for his own political gain. Wilders, who lives under constant police protection in an undisclosed location, is undeterred by threats from the Taliban to escalate attacks against Dutch soldiers in Afghanistan if the film is released. Nor is he moved by Dutch expatriates abroad who, remembering the fallout from the Danish cartoons featuring the Prophet Muhammad, worry that the film may make their lives harder, or even dangerous. Framing himself as a defender of free speech, Wilders said there would not be such a fuss about his film if it were about the Bible. "We can never allow people who use nondemocratic means, people who use violence instead of arguments, people who use knives instead of debates, we can never allow them to set the agenda," he said. After the 2004 release of a short film here that graphically portrayed the abuse of women in the Islamic world, the director, Theo van Gogh, was killed by a Muslim extremist. Wilders, already in the Dutch Parliament for six years at that point, was not associated with that film, but he went briefly into hiding when government security forces feared he might become the next target. Two years later, memories of the van Gogh murder — coupled with concerns about Muslim immigration — helped Wilders and his newly formed Party for Freedom capture 6 percent of the seats in Parliament. Of the Netherlands' 16.5 million residents, a million are either Muslim or of Muslim descent. Wilders says he detests Islam but not Muslims. He was raised Roman Catholic, but is no longer religious. He traveled and worked his way through the Middle East for two years after his high school graduation. Since then, he said, he has visited Israel at least 40 times and maintains close contacts there. 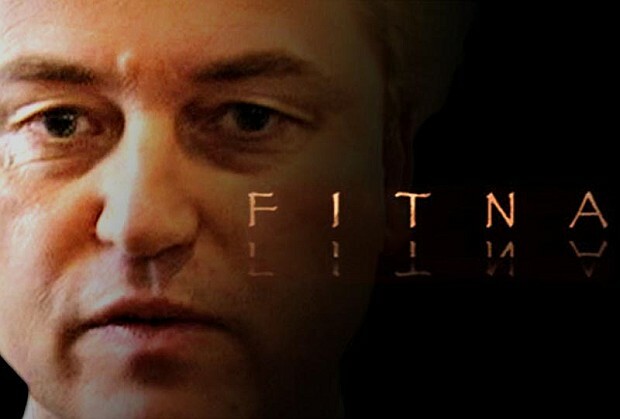 Geert Wilders has had to cancel the March 28 press conference where he intended to show his 10-minute movie Fitna. The Nieuwspoort press center in The Hague wanted Wilders to pay 400,000 euros for extra safety measures. No Dutch broadcaster has been willing to show the film. Dutch international companies, fearing a boycott of their products by Muslims, have announced that they intend to hold Wilders responsible for a loss of profits and markets in the event of a boycott. 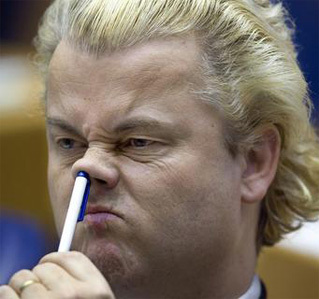 Lawyers have already lodged some fifty formal complaints against the politician for "incitement to racial hatred and discrimination of Muslims" because Wilders expressed the opinion that the Koran is "a fascist book which should be banned in the Netherlands." Last November, when Wilders announced he was going to make a movie expressing his view on Islam and the Koran, Doekle Terpstra, a member of the board of directors of Unilever, told the Dutch media that "Geert Wilders is evil, and evil has to be stopped." Terpstra called upon the Dutch to "rise in order to stop Wilders from preaching his evil message." Wilders has been living under police protection for almost four years. Muslim fanatics have threatened to assassinate him for his outspoken criticism of Islam. The politician has no fixed residence and has to live in army barracks or other heavily secured premises. Last week, leading Dutch journalist Henk Hofland proposed that the Dutch authorities lift Geert Wilders' police protection. Hofland asserted that, if Dutch citizens get murdered in retaliation for Wilders' opinions on Islam, not the assassins are to be blamed, but the politician. Hofland is not the only Dutchman willing to deliver Wilders and other critics of Islam to those who want to murder them. In an interview last week, Wilders, who is married but has no children, said that he is prepared to die for his opinions. Europe is anxiously awaiting Geert Wilders' movie on the Koran. The Dutch government fears that the release of the movie might lead to terror attacks on the Netherlands or on Dutch citizens abroad. The government may seek to ban the film. Last week Wilders complained that the Dutch authorities are putting him under pressure not to release his 10-minute film. Yesterday, a poll showed that the governing Dutch Christian Democrats of Prime Minister Jan-Peter Balkenende are losing popularity because of their attempts to tone Wilders down. Wilders likes to point out that the Koran is "as intolerant and dangerous as Adolf Hitler's Mein Kampf." If his movie shows praying Muslims next to marching Nazis, or if it compares Koran verses to antisemitic rants by Hitler, that may seem outrageous to Western eyes. But it will hardly affect Muslim radicals, who tend to agree with Hitler. If Wilders were a wiser man he would have focused on the question whether Muslims belong in the Netherlands rather than on whether or not the Koran is an intolerant book. He is putting his own life at stake as well as that of millions of his compatriots. Last year, Geert Wilders was charged under articles in the Dutch penal code that forbid group insult, hate speech, and incitement to discrimination. Wilders had made such statements as: "The heart of the problem is the fascist nature of Islam" and "Islam is a violent religion." The trial dominated public debate in the Netherlands for months. Wilders' lawyers successfully appealed for a declaration that the judges in the Amsterdam District Court had appeared biased. The trial will now have to start all over again. The public prosecutor, Paul Velleman, initially refused to prosecute Wilders. In refusing to press charges, Velleman acknowledged that Wilders' statements "may have been insulting for Muslims," but concluded that Wilders was not guilty of lawbreaking, since the statements were made "in the context of public debate." The court heard three defense witnesses: Hans Jansen, an author of books on Islam; his former student, Simon Admiraal; and Wafa Sultan, a journalist who grew up in Syria. Admiraal said Islam is an ideology and testified that Wilders had correctly translated the Koranic verse that opens his film Fitna: "Prepare for them whatever force and cavalry ye are able of gathering to strike terror, to strike terror into the hearts of the enemies, of Allah and your enemies." Jansen emphasized that Islam prides itself on the destruction of the Christian and Zoroastrian empires that flourished in the Middle East before Islam. He said that no moderate Islam exists, that moderate Muslims exist but they do not have scripture on their side. Sultan said that inequality between men and women, aggression toward unbelievers, and the lack of ambition and scientific development found in the Islamic world were all rooted in the essential teachings of Islam. The public prosecutor, Paul Velleman, addressed the charges against Wilders and demanded an acquittal. Wilders' main defense lawyer, Bram Moszkowicz, appealed to the challenging committee that the judges appeared biased. The committee agreed and the judges were dismissed from the case. Preparing a retrial may take a year. The Wilders trial has inflamed feeling everywhere in Europe about the place of Islam in European society. Islam itself may stand trial in Holland. Lawyers for Geert Wilders say that if their client's case is not dismissed they want a retrial with new defense witnesses including Mohammed Bouyeri, the extremist serving a life sentence for the 2004 murder of filmmaker Theo van Gogh. Wilders faces charges of inciting hatred against Muslims after he compared Islam to fascism and called for a ban on the Quran. His case pits his right to free speech against the right of Muslim immigrants to freedom from insult and discrimination. A new panel of judges is hearing the case against Wilders after the previous tribunal stepped down last October. The panel must decide whether to dismiss the charges, change the venue, or begin all over again. The legal process so far has been a farce. Prosecutors at first declined to press charges. But an appeals court ordered the prosecutors to bring the case to trial. Prosecutors presented their case and then called for acquittal on all counts. Before the trial judges could rule, allegations emerged of possible bias. A review panel ordered a new set of judges to take over the case. Prosecutors say the case should not be dismissed but that defining the nature of Islam is out of scope. AR The trial, if and when it finally results in a judgment, could be historic, for all of us. Geert Wilders, 48, is a man to watch carefully. His Party for Freedom, founded in 2005, is the third-largest political party in the Netherlands. At his parliamentary office in The Hague, Wilders complained that the Obama administration isn't doing nearly enough to combat the "totalitarian fascist ideology" of Islam. Wilders was raised a Roman Catholic in the town of Venlo but was not much of a student. He quit school and went to stay in a Jewish farming settlement on the West Bank. Back in the Netherlands he worked briefly in insurance before going into politics. Populist politicians in the Netherlands shaped his hostility to Islam. In recent years Wilders has dabbled in U.S. politics. On September 10, 2010, he delivered the keynote address at a rally in New York to denounce the Ground Zero mosque. "A tolerant society is not a suicidal society," he warned. "We must not give a free hand to those who want to subjugate us." Wilders has no shortage of influential allies in America. His incendiary documentary film Fitna, attacking the Quran as a manifesto for violence, was given a special screening on Capitol Hill in 2008. His new book, Marked for Death: Islam’s War Against the West and Me, is due out in April.